If 2013 had anything to say to me, it’s only that though the times keep changing, there are still movies, and critics and audiences to watch and admire them. Roger Ebert died in 2013. He was a huge influence on an entire generation of film critics, myself included. There is no longer that single point of reference where, after finishing my own review, I can see what the rest of the world will read. As intimidating and dominating as his fame was, I can’t necessarily say that his loss is good for the movie-review ecosystem because he was such an important part of it. But we carry on. Celluloid is now on its last legs, existing mostly as an expensive stylistic choice (David O. Russell chose film for American Hustle). Digital video has taken over. But movies are still made. Strangely, two feature films were produced this year on vintage video equipment as stylistic choices. Both were set in the 1980s, and both were shot on cameras made at the time. No features Gael Garcia Bernal leading an anti-Pinochet media campaign; Computer Chess is about a high-stakes computer-programming competition in a low-budget hotel convention center. And of course the constant churn of faces and personalities continues. To pick one memorable example, "Benedict Cumberbatch" is a mouthful I’d never committed to memory before 2013. Yet it seems lately this intense young man is everywhere. 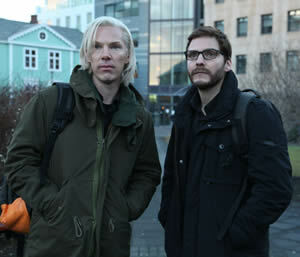 From villain in Star Trek: Into Darkness and a supporting role in 12 Years A Slave, to the voice of the dragon in The Desolation of Smaug and the lead role in The Fifth Estate. In fact, he inspired Movie Habit to add a "who’s trending" sidebar on our home page. I did see a lot of good movies in 2013, but none of them captured everything that the cinema has to offer — excitement, spectacle, drama, and human insight. Maybe Gravity comes close, but it also had a scene or two that I thought worked against it. So perhaps that makes the ordering on this list less important and more arbitrary. Ten more titles for another year-end list. The march of time and cinema continues. 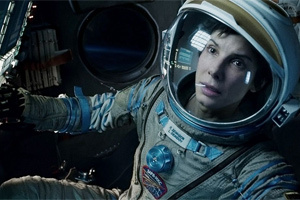 Gravity: I almost never put a tentpole movie first, but it’s the only film I gave four stars to. Short Term 12: Great storytelling from first-time feature director Destin Cretton. Endings are really hard to write, and Cretton nails his, tying up all the loose ends from the various threads, and bringing the first scene back, cast in a new light. 12 Years a Slave: highly anticipated, intensely hyped, and yet it lives up to expectations. Disturbing and frank in the mistreatment of its main character, yet much more approachable than McQueen’s Hunger and Shame. The Great Beauty: included for pure cinematic exuberance. I’m not sure all audiences will be able to relate to the aging Roman socialite, but director Paolo Sorrentino’s film feels more alive than most. The Desolation of Smaug: I stand corrected. Cinematic exuberance can take many forms, and the adventurous spirit of the second installment of The Hobbit made me envious of all the teens learning to love movies by buying ticket after ticket to this film. Museum Hours: An unassuming film with a small budget and only a few actors, the film manages to capture the spirit of travel, of discovering a place, and by acts of hospitality, rediscovering your own home town. Great performances, and a fluid, natural script keep the film grounded in real, life-sized emotions. Neighboring Sounds: By putting "Sounds" in the title the film draws attention to its sonic experience. Slightly mysterious filmmaking gives you the sense that something big is about to happen and keeps you on edge as we get to know the mixed Brazilian neighborhood. Some critics consider this a 2012 release, but I didn’t see it until 2013. The Angels’ Share: Ken Loach lets himself show a little more humor than usual in this tale about the theft of some very valuable whiskey. As a recent convert to the joys of fine spirits I appreciated the movie’s pause to explain the appreciation of whiskey, and how taking it seriously can be a positive life-changing course (see also Somm, Drinking Buddies, and The World’s End, all from 2013). No: shooting on vintage video was a huge risk, and frankly I couldn’t imagine the experiment working. But before the second or third shot, less than a minute into the film, I was already engaged with the characters and oblivious to the imperfect quality of the image. I probably have a soft spot for media creators as heroes, and the fact that this was based on a true story (it’s about a television campaign against Augusto Pinochet) sweetened that sensation. The Wind Rises: filmmaker Hayao Miyazaki announced this would be the last film he would direct. An admittedly hard sell, the film tells the story of the engineering of the Japanese Zero. Anyone who knows Miyazaki’s work knows he’s only fascinated by the flying machines, and not at all with their use as machines of war. Nevertheless there’s an intriguing mix of pride and shame in the story, a sort of defiance that, in spite of Japan’s involvement in World War II, not every citizen is guilty, nor even complicit. If others argue this isn’t his best work, I might not disagree, but in his mastery of detail and gesture, he hasn’t lost anything. The protagonist — an engineer, not an animator — nevertheless feels like Miyazaki reflecting on his own younger self. A fine and fitting cap to an amazing career. I Used to be Darker: a slow-to-start drama about a young Irish girl visiting her American relatives who happen to be in the midst of a divorce. Understated performances and musical scenes allowed to play out make this slow-boil drama engrossing. 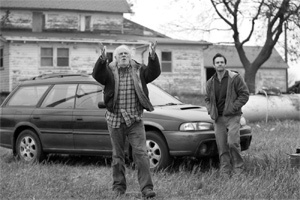 Nebraska: aging parents and dying Midwestern towns hit close to home and capture the feeling of family. Inside Llewyn Davis: a more polished film than many on this list. Perhaps it only misses a top spot because we’ve come to expect so much from the Coen brothers that when they produce a good film, we take it for granted. How I Live Now, which posits that when the next World War breaks out, the British countryside is the ideal place to be. Computer Chess, for is visual daring (see also No). Reality, an impressive Italian comedy/drama for its luscious opening 20 minutes. Gloria, for a winning performance from Paulina García. Europa Report, for offering us science nerds exactly what we’ve been asking for since 2001. Frances Ha, a daring character and performance from Greta Gerwig and Noah Baumbach. In a World..., showing that Lake Bell is a new triple threat. Le Week-End, with the perfect blue-jazz score for the situation: an older English couple retreat to Paris, each to spark a different change in their marriage. The Armstrong Lie - for its button-pushing sense of outrage. The We and the I, in which Michel Gondry and a troupe of very young New York actors get off the bus. Rush, which opened while I was in Toronto and played while we were cleaning up from the flood. Her, which still has not played in Colorado nor screened here for critics. Spring Breakers, Fruitvale Station. The Act of Killing had gotten a lot of buzz, mostly positive, by the time I had seen it. But as I watched the movie, the comment that resonated most sharply came from a film-festival friend (Bob LaRue) who was angry at the filmmakers, first for for lying to his subjects about what sort of movie he was making, second for giving a microphone to these moral midgets (yes, the murderer’s on-camera dawning of remorse was a powerful scene, but what human being takes fifty years to understand that murder is wrong?). The rest of these I liked, but not well enough to put on my list: American Hustle, Before Midnight, Captain Phillips, The Grandmaster, A Touch of Sin, All is Lost, Blue is the Warmest Color, Blue Caprice, Enough Said, Gimme the Loot, The Hunt.